M3 (Stuart I) knocked out during fighting in North Africa, Apr 1941. Bundesarchiv Bild 101I-783-0107-14A. RTR tank crews being introduced to the new American M3 Stuart tank at a training depot in Egypt, 17 Aug 1941. Note the Matilda in the background. IWM photo E 3438E. Men of the Royal Tank Regiment examining the tracks and suspension of the new American M3 Stuart tank at a training depot in Egypt, 17 Aug 1941. IWM photo E 3443E. Men of the Royal Tank Regiment, training on the new American M3 Stuart tank, being inspected by Mr Walter Kirk, American Minister to Egypt, 17 Aug 1941. IWM photo E 3450E. New American M3 Stuart tanks on test, 19 Aug 1941. IWM photo E 3410E. 8th King's Royal Irish Hussars training with their new Stuart tanks, 28 Aug 1941. IWM photo E 3467E. 8th King's Royal Irish Hussars training with their new Stuart tanks, 28 Aug 1941. IWM photo E 3469E. The 8th Hussars testing their new American M3 Stuart tanks in the Western Desert, 28 Aug 1941. IWM photo E 5062. The 8th Hussars testing their new American M3 Stuart tanks in the Western Desert, 28 Aug 1941. IWM photo E 5086. 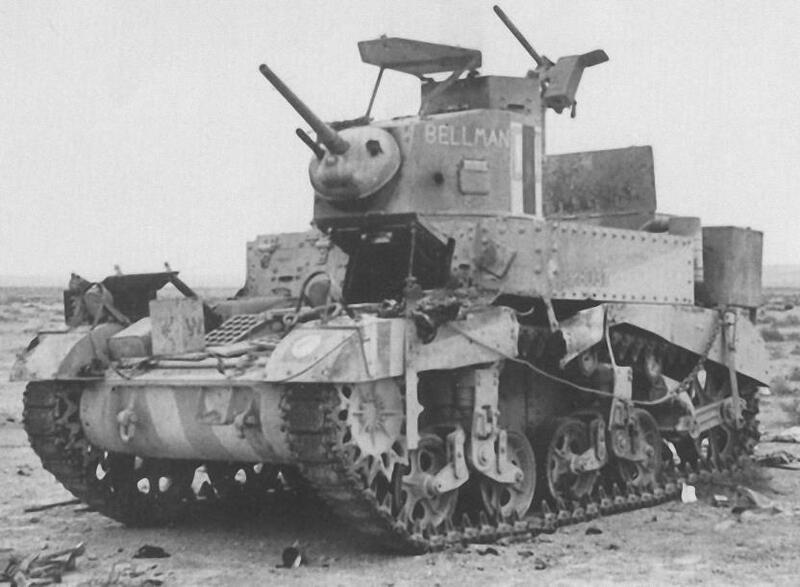 ''BELLMAN'', an M3 Stuart tank of 8th Hussars, 7th Armoured Division, knocked out near Tobruk, 15 Dec 1941. IWM photo E 7044. The commander of a Stuart tank uses a knocked-out PzKpfw III tank as cover while observing the enemy, 1 Jun 1942. IWM photo E 12670. 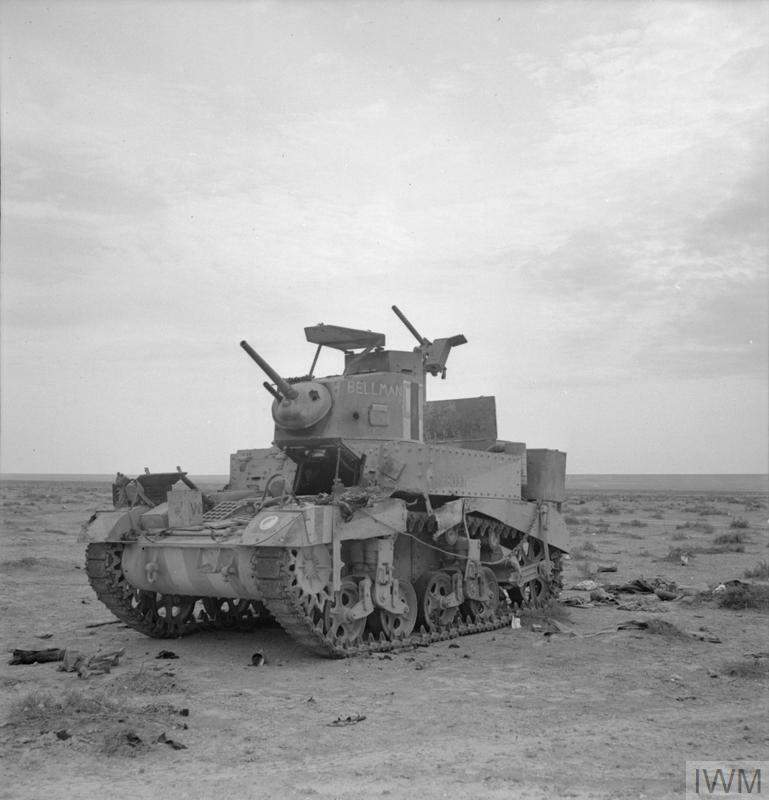 A Stuart tank being refuelled from an RAF fuel bowser outside Sidi Barrani, 15 Nov 1942. IWM photo E 19587. A Stuart tank comes to the rescue of a truck which has become stuck in soft sand near Nufilia, 26 Dec 1942. IWM photo E 20485.